The Chancellor Tobacco Company is proud to represent the magnificent masterpieces of its handmade accessories of an exhibition grade, solid walnut burl with captivating structure, a structure each artist dreams to impress on his canvases. The structure that gets the walnut during not less than 1000 years is unique in all over the world and the value of this natural treasure is everlasting. The wise use of solid exhibition burl walnut by skillful craftsmen, using absolutely manual system which gives to the collection an exclusivity. The main items are individually numbered and are written in a special book. Besides solid walnut wood C.T.C. also uses solid silver and gold items. The blend of sterling silver with exhibition walnut gives to the products elegance and beauty. 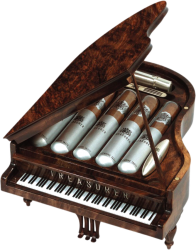 Handmade , polished solid exhibition burl walnut Piano for 5 tubed cigars, with sterling silver inlay, silver humidifier, accompanied by a stylish blowtorch lighter and a cigar punch. 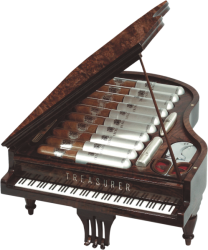 Handmade , polished solid exhibition burl walnut Piano for 10 tubed cigars, with sterling silver inlay, accompanied by a silver humidifier, stylish blowtorch lighter, cigar cutter and cigar punch. 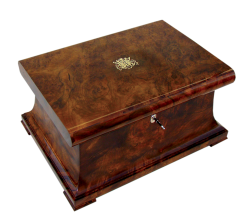 Handmade, polished, exhibition grade solid burl walnut humidor, inside a stainless steel humidifier, solid Spanish cedar wood, each individually numbered, with silver logo inlaid and silver key for 75/100/125 cigars. 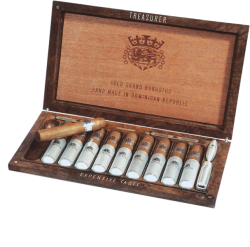 Handmade, polished, solid burl walnut travel humidor for 10 tubed cigars, lined with Spanish cedar, inlaid with sterling silver, accompanied by a stylish blowtorch lighter and a cigar punch. Handmade, polished solid burl walnut box for 5 tubed cigars with silver logo inlaid. 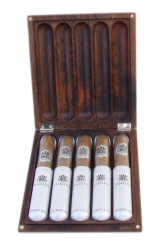 Handmade, polished, solid walnut travel humidor for 5 tubed cigars with sleek aluminum banding, lined with solid Spanish cedar, accompanied by a blowtorch lighter, humidifier and cigar punch. Handmade, walnut travelling box for 25 cigars, secured by a scarlet berry and satin ribbon. 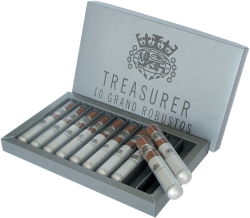 10 tubed cigars in retail box. Solid Gold plated cigar pocket holder for 2 Grand Robusto cigars. The holder interior is lined with Spanish cedar. 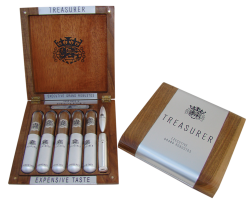 Sterling silver cigar holder for 2 Grand Robusto cigars . The holder interior is lined with Spanish cedar. 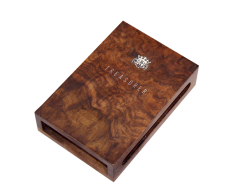 The cigar holder is made of polished burl walnut and is available for 2 or 3 cigars in Robusto and Churchill size with silver logo inlaid. 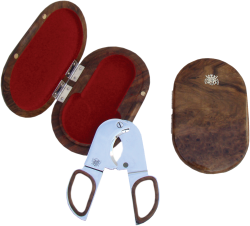 Cigar cutter is made of the finest steel and is presented in a polished burl walnut pocket case with silver inlaid logo. 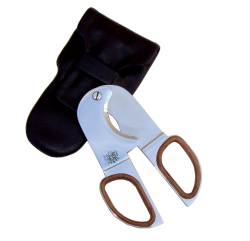 Cigar cutter in a finest leather case. 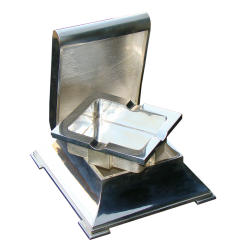 Silver ashtray is made of solid sterling silver with removable silver tray. Ashtray is made of polished burl walnut with a sterling silver interior and inlaid logo. Handmade, polished burl walnut box for matches with silver logo inlaid.